Stretching from the Arctic Circle in the north to the U.S. in the south, the nation-state of Canada is awonderful North American country and home to enormous exquisiteness and delight. Canada is one of the largest countries of the American continent with a range of destinations known for the dazzling beauty and thrilling adventure. The capital of the country, Ottawa, is an astounding destination. Also, the French-speaking Quebec and Montreal cities areknown to offer an inspirational experience with their unique blend of colonial and modern architecture.Moreover, cities like Toronto and Vancouver are considered as the must visit destinations of Canada. The cities offer extensive beauty and some very exotic ventures. Other prominent cities include London Ontario,Victoria, Edmonton, and St Johns. The wilderness and parks of the country are subject to visits by millions of people throughout the year. The Banff National Park is a lake-filled park situated in the Rocky Mountains. The park is an excellent example of Canada's rich and unique wildlife. In addition, the Niagara Falls are known to be the prime reason for the country's popularity as an important tourist destination. The famous waterfalls are visited by peoples of different nations coming from all around the world. Canada can be described as a North American heaven for tourists. We at TravelWideFlights are providing our respected clients with economical flight tickets to Canada with the most spectacular Airlines of the world including the American Airlines, Air France, Delta Airlines, United Airlines, and British Airways. 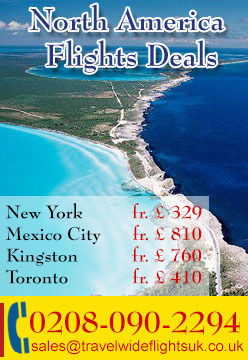 We can also provide the clients with cheap bookings in top resorts and hotels of Canada. Contact us for further guidance.